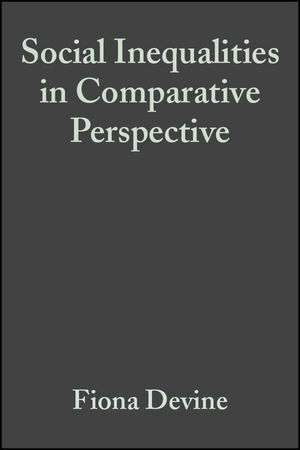 This unique collection of original essays brings a comparative perspective to issues of social inequality. First-rate sociologists from around the world have contributed to this exciting and rigorous volume, drawing upon their own research in the fields of race and ethnicity, class and inequality, and gender and sexuality. Fiona Devine is Professor of Sociology at the University of Manchester. She is the author of Affluent Workers Revisited (1992), Social Class in America and Britain (1997), and Class Practices: How Parents Help Their Children Get Good Jobs (2003). She is the co-author, with Sue Heath, of Sociological Research Methods in Context (1999). Mary C. Waters is Professor and Chair of the Sociology Department at Harvard University, and co-director of The New York Second Generation Project. Her publications include Ethnic Options: Choosing Identities in America, (1990); the award-winning Black Identities: West Indian Immigrant Dreams and American Realities (1999); The New Race Question: How the Census Counts Multi-Racial Individuals (with Joel Perlmann, 2002); and The Changing Face of Home: The Transnational Lives of the Second Generation (with Peggy Levitt, 2002). Professor Waters was a Guggenheim Fellow (1993-94) and a Visiting Scholar at Russell Sage (1991-92). 1. Introduction: Fiona Devine (University Of Manchester ) And Mary C. Waters (Harvard University). 2. Race, Ethnicity And Immigration In The United States: Mary C. Waters (Harvard University). 3. The ‘Language Of Race’, Identity Options And ‘Belonging’ In The Quebec Context: Micheline Labelle (University Of Quebec). 4. Race And Ethnicity In France: Riva Kastoryano (Centre National De La Recherche Scientifique). 5. Racisms, Ethnicities And British Nation Making: Liviu Popoviciu And Mairtin Mac An Ghaill (Both University Of Newcastle). 6. Working Poor, Working Hard: Trajectories At The Bottom Of The American Labor Market: Katherine Newman (Harvard University) And Chauncy Lennon (Columbia University). 7. Class And Social Inequalities In Portugal: From Class Structure To Working Class Practices On The Shop Floor: Elísio Estanque (University Of Coimbra). 8. Understanding Class Inequality In Australia: Bill Martin (Flinders University ) And Judy Wajcman (Australian National University). 9. Talking About Class In Britain: Fiona Devine (University Of Manchester). 10. Research On Gender Stratification In The U.S.: Christine L. Williams (University Of Texas), Patti A. Giuffre (Southwest Texas State University), Kirsten A. Dellinger (University Of Mississippi). 11. The Japanese Paradox: Women’s Voices Of Fulfillment In The Face Of Inequalities: Yuko Ogasawara (Nihon University). 12. Catching Up? :Changing Inequalities Of Gender At Work And In The Family In The UK: Harriet Bradley (University Of Bristol).